The latest trend in home décor is utilizing the space right outside your back door- specifically with the use of outdoor fireplaces. These can be as simple as common wood burning fire pits or as grand as full scale fireplaces. Outdoor fire pit tables offer a consumer a wide variety of ways to enjoy their time in their very own backyard. Many come with options of grill, ice bucket, and removable center inserts. For those who want something different from the standard log system, fire glass crystals may be available for the look of a glowing jeweled fire. One such table is the San Simeon Outdoor Fire Pit Table. This table comes standard with a 1.25” thick granite table top and powder coat finish base. The weather resistant, easy to maintain 48” round table top is available in three color choices- pebble, sea green, and sunset gold. The sturdy base keeps the table level with no sagging. The color options of chocolate brown, sage, black, and adobe are in a powder coated finish which ensures a long, tarnish-free life of the base. Individualize the purchase by choosing a color combination that will complement your outdoor home decor. 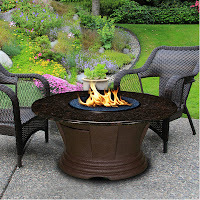 The San Simeon Outdoor Fire Pit Table can be used with natural gas or liquid propane. It comes standard with gas logs and a stainless steel burner. This table can be customized with the optional features when ordering. Along with a stainless steel grill, stainless steel ice bucket, fire glass crystals, and removable center insert, is the option to purchase a vinyl insulated cover. To further preserve the original beauty of the granite top, a customer care package is included, which provides information on periodic cleaning. This table is one of the nicest looking outdoor fire pit tables on the market. It comes with simple step-by-step instructions for easy set up and a one year warranty. So sit around a dancing fire as you enjoy a beautiful night of relaxation or a pleasant evening socializing with friends and family.